Today is the last time we will hear from costume designer Louise Page on her choices of ties worn by David Tennant. The final tie is by Massimo Dutti, and was only ever seen in one episode, The Doctor’s Daughter. 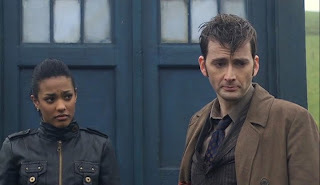 It does briefly appear in the closing scene of the previous episode The Poison Sky which runs directly into the next adventure, thus keeping continuity between the scenes. Louise tell us about this final tie. 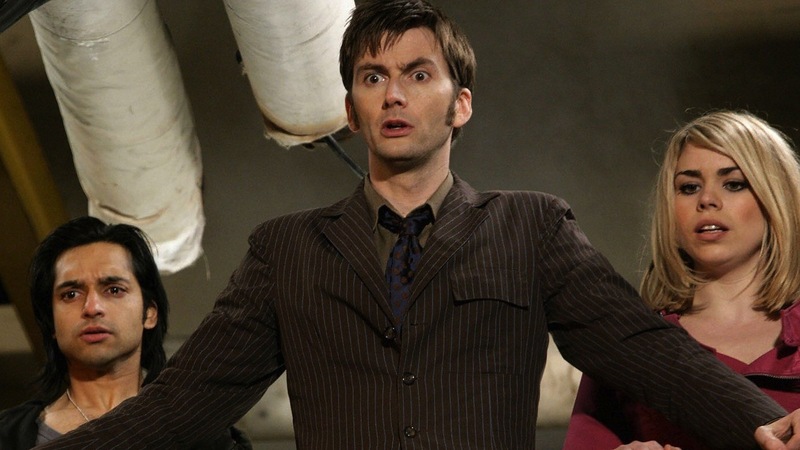 This was Louise’s final interview about the Tenth Doctor’s ties. But never fear, she will return very soon to tell us about several other aspects of The Doctor’s wardrobe, including his suit, overcoat and space suit! Check back so to hear what she has to say. 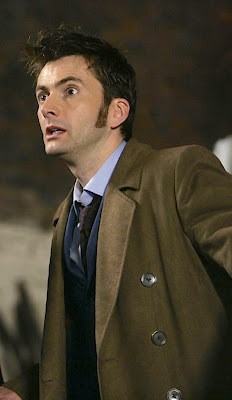 The penultimate tie in The Doctor’s wardrobe is a bit of an odd-ball in my mind. It is made by Massimo Dutti, and features predominately in The Next Doctor, the 2008 Christmas Special (see left). 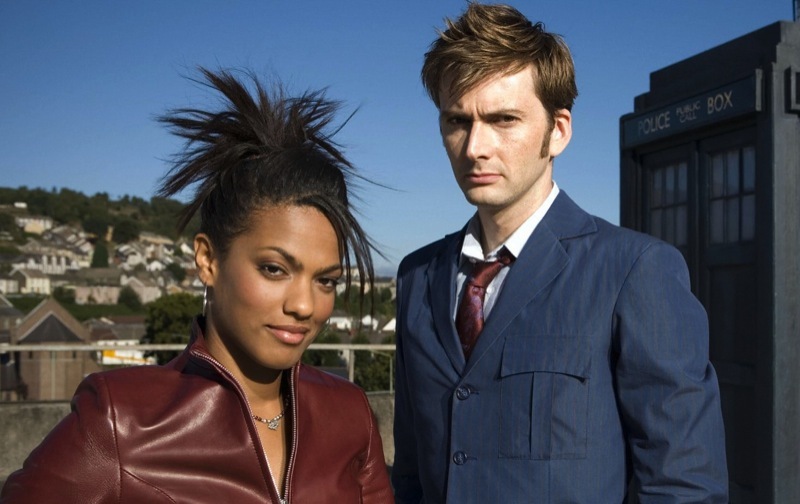 However, it had first appeared back in Partners In Crime, the series four opener, although it shared screen time with Tie Two, the Daniel Hechter tie, making it less memorable. Costume designer Louise Page remembers the tie. Check back VERY soon to see Louise Page talk about the final Tenth Doctor tie - and in an EXCLUSIVE - she reveals the label behind the tie . . .
We are getting down to the last few ties in my tie index, and costume designer Louise Page is on hand today to tell us about Tie Ten, the St George by Duffer. It was first seen in Utopia, and the subsequent episodes The Sound Of Drums and The Last Of The Time Lords. Louise had explained to us that for the series two double episode, The Impossible Planet and The Satan Pit, she had chosen a new tie (Tie Six) for a one-off use in that story, thus reducing the the chance of over exposure of her more favourite ties. So when it came to the season finale story arc to series three, she put the same principle into practice, using a brand new tie that after this story was never seen again. Louise explains the background to this unique tie. The second tie to be worn with the blue suit was made by Japanese label, Kenzo. With its appearances in lots of publicity stills, as well as being seen on display at exhibitions, you would be forgiven for thinking the previous Nina Ricci tie was worn more, but you’d be wrong. The Kenzo tie was first worn in the two part story Daleks In Manhattan and Evolution Of The Daleks, but it went on to crop up extensively in The Lazarus Experiment, The Last Of The Time Lords, Time Crash, Voyage Of The Damned, The Unicorn And The Wasp, Silence In The Library, Forest Of The Dead, The Waters Of Mars – that’s almost triple the appearances of the Nina Ricci! The next tie costume designer Louise Page will tell us about is the first to be worn with the blue suit, introduced in series three. This beautiful tie, by designer Nina Ricci, was first seen in season opener Smith And Jones (see right), and cropped up again for the later two part story The Sontaran Stratagem and The Poison Sky. 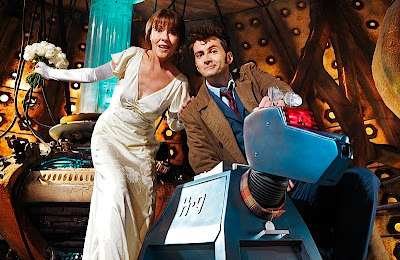 It was notably worn in the Sarah Jane Adventures cross-over story The Wedding Of Sarah Jane Smith (see below). 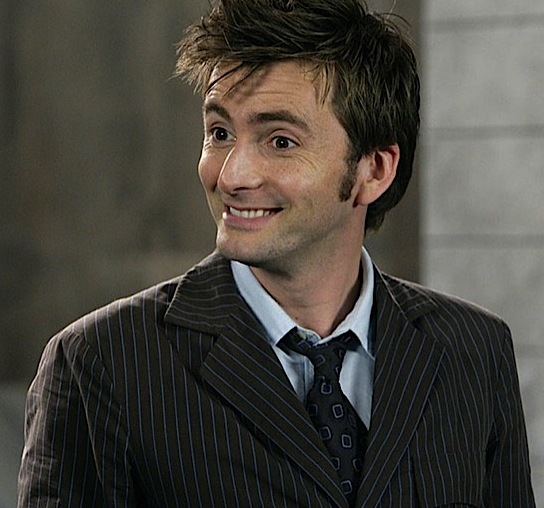 This was the last time David Tennant went before the cameras as the Tenth Doctor. 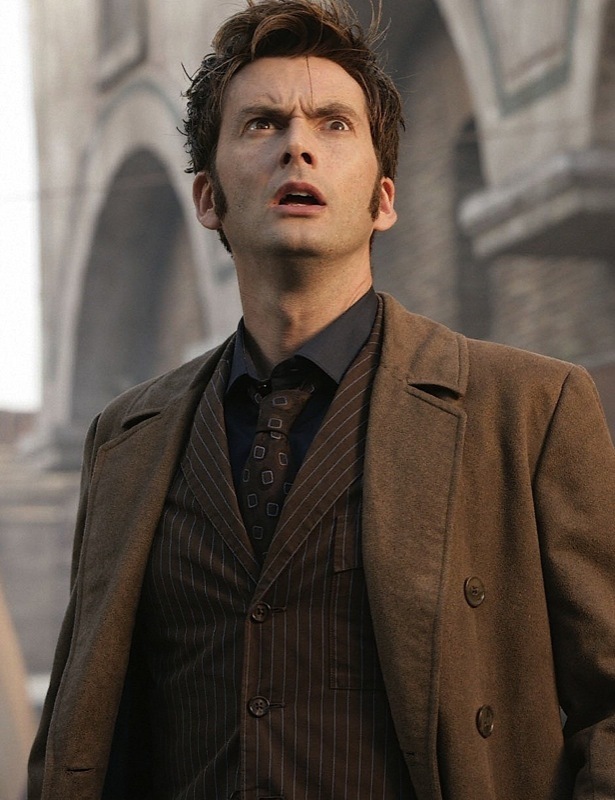 Although it was shown before his departure in The End Of Time, due to the shooting schedules on the two series, it was actually shot after the regeneration scene had been filmed. Louise explains her colour palette for the blue suit, as well as how it was decided which episodes it would specifically appear in. 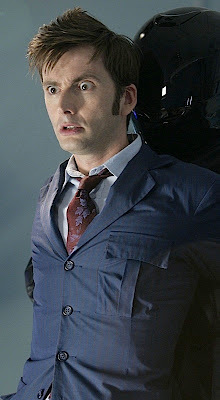 We are now just over halfway through the Tenth Doctor’s tie wardrobe, and we come to Tie Seven, the Giorgio Armani tie. It first appeared briefly in Love And Monsters, but had been featured extensively in Army Of Ghosts (see right) and Doomsday, which were shot first. It also was seen in Smith And Jones, The Shakespeare Code, Gridlock, Fires of Pompeii (see left), The Family Of Blood, Turn Left, The Stolen Earth, Journey’s End and Planet Of The Dead. Louise tells us about one of her favourite ties, and listen out for the nickname given it by her staff. Today we come to Louise Page’s story of Tie Six, a rather forgotten about tie which appeared principally in The Impossible Planet and The Satan Pit. It did crop up briefly in Human Nature and The Family Of Blood, but beyond that was never seen again. Louise explains why she choose this tie over the more popular ties such as the Daniel Hechter.